Sometimes for social media to be effective in communicating to your audience, you have to rely on some guidance from the experts. 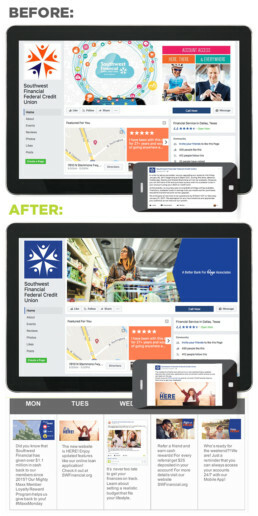 Our mission for Southwest Financial Federal Credit Union was to revamp their social media by developing a strategy to gain more followers and creating content that was clear, cohesive, and consistent. The majority of our research was focused on analyzing our client’s brand and identifying areas for improvement. From this research, we were able to develop a strategy designed to increase the reach of all social media channels, engage the audience with helpful information and resources, and increase brand awareness in three designated market areas. Our first objective was to revamp the brand and establish standards. We started by updating the avatar and cover photo on the client’s page and stuck to a two-tone color scheme, appealing stock images and graphics, and simple taglines. The brand development extended into creating a consistent tone that was personable and resourceful. We provided guidelines on how to cut-down on formal text and communicate in a way that was short, to the point and visually appealing. Our second objective for Southwest Financial FCU was to maintain and grow their following by establishing content that was timely and consistent. For each month we picked a theme and created posts that fell under five categories. This created variation in content that was resourceful, informative, and engaging. Additionally, we developed a posting schedule so our client could maintain their presence and increase brand awareness. Our efforts to establish clear branding and content strategy helped our clients manage their social accounts with ease. They gained confidence in knowing that they were communicating effectively with their target audience and maintaining a healthy presence on social media.